Keyboard shortcuts are a great way to increase productivity, they save precious seconds while working. There are plenty of keyboard shortcuts for MS Office, Windows Explorer and Gmail. Gmail has so many shortcuts that many of us don’t know a lot. If you are working most of the time with your computer, then learning some of these keyboard shortcuts will help you save time and do the work more efficiently. Like I said we don’t know many shortcuts for these programs that exist, enter KeyRocket, a free program for personal use will help you learn new keyboard shortcuts for MS Office, Win Explorer and for Gmail using an extension for Chrome. If you are a Google Chrome user, download this extension KeyRocket for Gmail. This add-on teaches you shortcuts for actions you do in Gmail. For example, clicking on Inbox, Reply or Sent Mail etc., KeyRocket will give a popup showing you the shortcuts you could use for that action. The popup suggestions will disappear after a few seconds. You can press “?” to see the master list of keyboard shortcuts anytime. 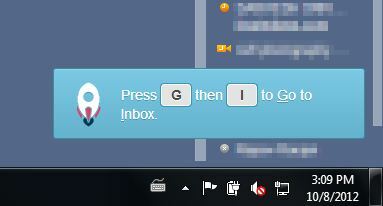 This is a great add-on for those who work with Gmail in Chrome. KeyRocket program for Windows works with Windows Explorer and MS Office programs. The free version of the program allows you to use only one of the Office application that is Word or Excel or PowerPoint or Outlook. When you use Windows explorer or Office application it with a mouse it will show you the shortcut that existed. For example in Word when you change the line space to 2 it will show you the shortcut Ctrl + 2 in a popup. The popup will disappear after few seconds. Similar popups will appear when you work with files using Windows Explorer. 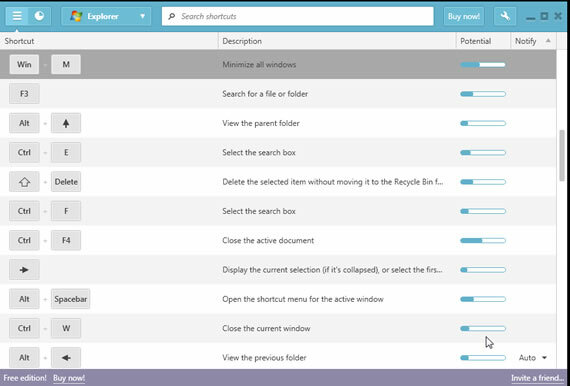 From the application you can see the list of shortcuts supported, you can search through the shortcuts also. KeyRocket has an extensive list of shortcuts ranging from simple ones to advanced ones. KeyRocket works with Office 2003-Office 2013 and supports Windows XP, Vista and Windows 7.